Mums & Co, a leading business mums network, says the number of women running businesses with dependent children is set to rise. The Mums & Co Australian Mums in Business Report, the first in-depth report into the category, reveals that today's mum in business shows the true-blue Aussie spirit of having a go and is reporting a greater sense of wellbeing, with four in five who believe they are a happier person as a result of starting their own business. The report shines a light on Australia's hidden workforce – the 300,000 plus* business owner mothers (representing one sixth of all small businesses) who provide income for over half a million Australians. She can be an entrepreneur, running a family business or a self-employed consultant. 'Australian mums in business contribute significantly to our economy and it's time she's acknowledged and better supported. Her numbers are set to rise as women face increasing childcare costs, workplace inflexibility, unequal pay and at the same time, the gig economy is growing and technology makes it easier than ever before to launch a business. They now want to take back control of what's important to them. 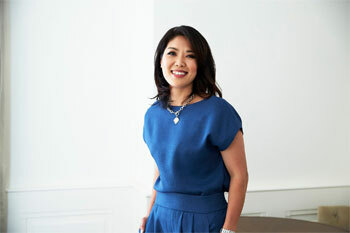 Nearly half started their own business as working for someone else was not viable," says Carrie Kwan, co-founder of Mums & Co.
'Our report indicates business mums have better wellbeing and embody the Aussie spirit of having a go. Four in five believe they are a happier person as a result of starting their own businesses. While most mums experience a sense of -mummy guilt', interestingly the majority of business mums do not agree that they feel guilty that they have less time to spend with their children. In fact, an overwhelming 87 percent believe they are setting a good example for their kids. 'As running their own business becomes the viable option for women to earn income and manage childcare duties, more needs to be done to help those looking to make the leap. The report shows that financial concerns – costs associated with setup and access to capital – as well as not knowing the fundamentals of business are major barriers stopping those who want to start a business," says Carrie. The report reveals that almost half believe being a mum has acted as a barrier to their business success and 50 percent found starting a business really challenging. More of them are turning to social media and networking groups to get the support they need – for community connections as well as information and talent sourcing. Mums & Co commissioned the report to better understand business owner mums, to more effectively help her thrive. 'We believe that we're stronger together. Just like it takes a village to raise a child, Mums & Co is an online village providing a safer and smarter way for mums to grow their business," says Carrie. She believes there's no better time than now time to start a business – a third started their businesses while on parental leave, one in 10 started their businesses while pregnant, and 6 out of 10 mums who started their business this year have an infant or toddler. Hidden workforce - most (84%) don't have staff; those who do on average employ four to five staff (mix of full time, part time, casual and contractors). Some were pushed into it - for some, the decision was made for them as they weren't able to find suitable employment, the role changed or they were made redundant while on maternity leave. Taking back control of what's important to her - half needed to start their own business as working for someone else was not viable. Mummy guilt and being a role model - most mums experience a sense of mummy guilt, interestingly, the majority of business mums do not agree that they feel guilty that they have less time to spend with their children. In fact, an overwhelming 87% percent believe they are setting a good example for their kids. Migrant Mums in Business - nearly one in three business mums are born overseas. Migrant mums in business were less likely to consider self-belief as a barrier to starting their business. They are less likely to worry about finances compared to Australian born business mums, but need more help with marketing and are more likely to rely on networking and online communities. This group had additional barriers in that they may not have family to rely on for child care (30% vs 50%). a barrier to the success of the business and half of all mums in business found starting a business very challenging. The Aussie mum in business is most likely doing it on her own – most don't have financial support from others, and over half (53%) are using their own savings or have taken a loan (15%) to fund the business. Question: Can you tell us about Mums & Co? Our efforts are focused on helping business mums save time, save money, being more productive, finding more family-friendly ways of working and opening up easier ways of doing business. Mums & Co provides mothers with rich online content and offer products and benefits designed to help business grow, from solid business advice to the practical things like emergency childcare. We have unique support that come from being part of IAG, so we are able to offer members have access to a range of perks that they wouldn't ordinarily get access to. Our concierge business services include HR resources and an insurance package tailored for mums in business. We also offer a platform to share knowledge and inspire through community stories. Question: What inspired the Mums & Co Australian Mums in Business Report? Carrie Kwan: Mums in business are a vital but often overlooked part of our economy. More needs to be done to support her. Mums & Co exists to help business mums thrive. We commissioned this report because we wanted to know her better, really understand her needs, so that we can support and help her more effectively. Question: What results surprised you most from the Mums & Co Australian Mums in Business Report? Carrie Kwan: Most mums experience a sense of mummy guilt so I found it very surprising that the majority of business mums do not agree that they feel guilty that they have less time to spend with their children. In fact, an overwhelming 87 percent believe they are setting a good example for their kids. Question: Can you share other results from the Mums & Co Australian Mums in Business Report with us? Carrie Kwan: The age of their kids have an impact on business mums. For instance, mums with children 2 years or younger are more likely to be influenced by flexibility (59%), passion (46%), and not wanting to spend money on childcare costs (21%). Time resourcing is considered more of a potential challenge for mums considering starting a business with children under 3 years old (40%) than those with children older (27%). Partners (65%), other family members (51%) and childcare centres (49%) have more of a role in looking after children than those with children 3 and older. Question: Do you believe the number will rise for Australian mums in business? Carrie Kwan: In one word – yes. Women are facing workplace inflexibility (nearly half surveyed started their own business as working for someone else was not viable), unequal pay and increasing childcare costs. The OECD's recent report into gender shows women are still lagging behind in pay due to women's disproportionate responsibility to provide unpaid caregiving, combined with the cost of childcare. At the same time, the gig economy (part time/ contract work) is growing and technology now makes it easier than ever before to launch a business. These findings indicate that Australian mums in business are taking back control of what's important to them. So we believe the number of mums in business is set to rise in the near future. Question: How important is this statistic to the Australian economy? Carrie Kwan: Mums in Business are our hidden workforce and a significant part of our economy. It's time they are better acknowledged and better supported. Australia's 345,000 business owner mothers represent one sixth of all small businesses. In addition, of those who employ staff, on average employ 4-5 staff, so in total, they generate income for over half a million Australians. Enabling more mothers to work on their own businesses means that they can balance the things that are important to them - the time to spend with their children when they most need it, the flexibility to raise families as well as achieve their ambitions. When doing meaningful work women have seen both their incomes and levels of self-reported happiness increase. Their business means they are more than just a mum. They get great satisfaction from being an entrepreneur and successful business woman. Question: Can you describe the most common Australian mum in business today? Carrie Kwan: The average mum in business has two kids and is likely to be educated. Half of all business mums are between 30 and 39 years old. Most are in relationships but one in ten are single parents. Nearly a third are born overseas. She's taking back control of what's important to her and she's happier for it. She is brave, remarkable and has that Aussie spirit of having a go. Going into business means leaving security behind and stepping into the unknown, and it's even more daunting when it's not just yourself you are looking after. A third started their businesses while on parental leave, one in 10 started their businesses while pregnant, and 6 out of 10 mums who started their business this year have an infant or toddler. More than half have businesses in a completely new field to what they were doing before. 84% have no staff but of those who employ staff, on average they employ 4-5 staff, so she provides income for another 216,000 Australians. A majority have the support of a partner in looking after the kids (60%), while four in ten call on family members, and school and childcare centres are also popularly used by business mums. Question: What challenges do these working mums have and how does Mums & Co help them overcome these challenges? Carrie Kwan: The journey is not always easy - almost 50% feel being a mum has acted as a barrier to their business success and 50% also found starting a business very challenging. Our report found more and more are now turning to social media and networking groups to get the support they need. Mums & Co is created specifically for the needs of mums in business so everything we do is geared towards helping them succeed and building a community of mothers in similar circumstances. We believe we are stronger together. Together we have the strength of community, better negotiating power and a pool of knowledge to draw on. Our platform and events are a supportive, inclusive and safe space to make community connections. Don't be afraid to ask other business mums for advice and support, because chances are, someone has already been there and done that. These connections also extend to sourcing information and talent. For those who are already in business, the report found that they need more help with knowledge about finances, marketing and setting up businesses correctly. Our knowledge sharing platform publishes quality articles to help with this gap, whereas Mums & Co perks and concierge partners give access to cheaper or free marketing services, legal and business set up products and services. Our simple business insurance package can also provide cover to protect your business. Question: What advice do you have for mums in businesses and mums considering starting their own business? Treat problems as a learning process – rather than let a problem defeat you try to develop the habit of using challenges as opportunities to get or master skills. When I'm uncomfortable, I remind myself; I'm learning! Celebrate my successes. I try to take time at the end of the week to acknowledge what my team and I've achieved. It's meant to train my mind to look for success rather than dwelling on negativity and -failure'. Taking positive action...and doing it before you're -ready'. One of my early mentors insisted that I only do one thing, and that was to take some form of action about the perspectives and strategies we discussed. No matter how small, make sure you keep doing something each day that moves you towards your business or life goal. And do it before you have all the answers. For example, if you're working on a website - don't launch it when it has all your wish list features and -perfect'. Launch it when you've got the sufficient features (not all the ones you would like) on your website to validate which ones your customers really are using and want. And which ones they'll pay for. Tweak and repeat. Join and lean into a community of other like-minded mums – it's really powerful having the strength of community and a pool of knowledge and resources to draw on. Don't be afraid to ask other business mums for advice and support, because chances are, someone has already been there and done that. I would advise anyone starting a business to create a network that they can draw on. And we've found that business mums tend to want to work with (or purchase from) other business mums too!